The bad thing about feeling better is that I am now expected to do more things. 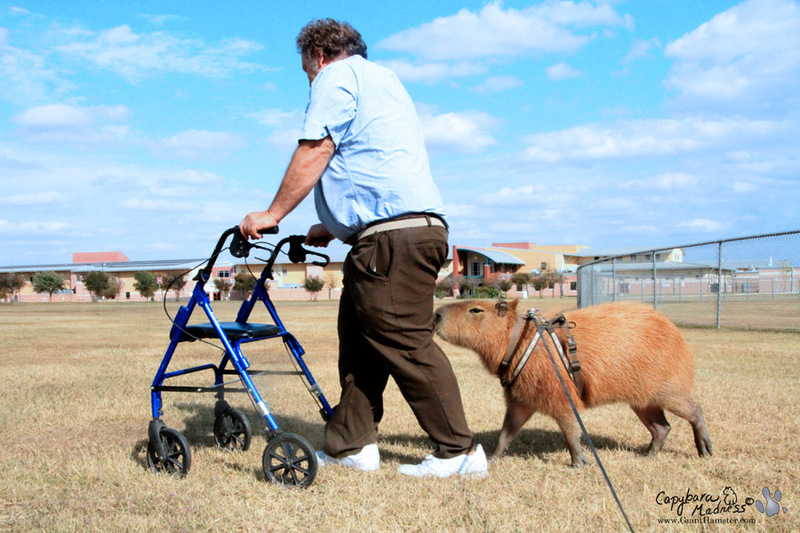 For example, on Thanksgiving, Melly and Rick took me for a walk at a local high school. On THANKSGIVING! Isn’t that supposed to be a holiday? Where was the holiday for me? I like to stay very, very close to Rick when we are out for a walk. Melly keeps saying I am going to give him a flat tire. This is dumb because I am not even close to the tires on his walker and I think they are solid rubber anyway. Normally I blame Melly for all the bad stuff that happens to me but I think I have to put the blame for ruining Thanksgiving squarely on Rick’s shoulders. He keeps saying that I have to go places that aren’t as scary as going to the vet so that I won’t be scared later. Well, let me tell you something! Everyplace that is not home is scary. Going in the car is scary. You never know where you will end up. And he’s let the cat out of the bag (that’s a saying Mellys uses even though I’ve never even seen Flopsy in a bag) on that whole vet thing. I know I have to go back. One good thing about being sick is that I get all kinds of delicious foods whenever I want. One bad thing about being sick is that I have to take medicine twice per day. Melly mixes it with yogurt and puts it in a syringe. Then she chases after me until she corners me someplace. 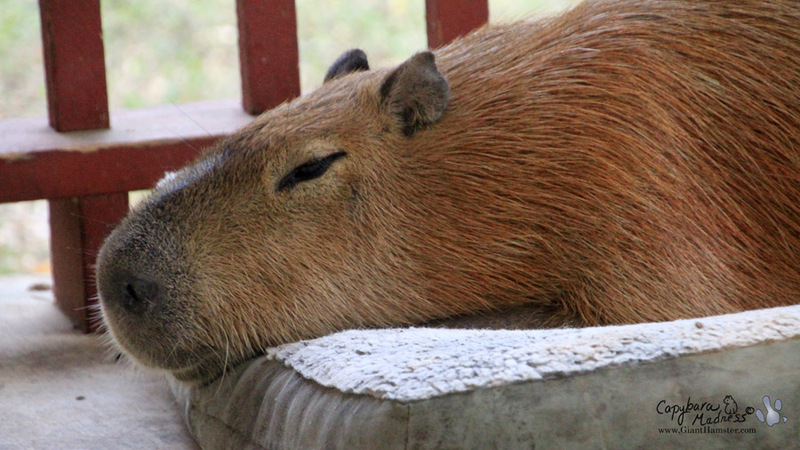 Then she sticks that syringe in my mouth and squirts that awful medicine down my cute little capy throat. Sometimes I threaten to bite her when she does that but so far it’s only been threats. This medicine thing has been going on for awhile and it looks like it will go on awhile longer. Dr. Hoppes, who is nice enough for a vet but still a vet, is gone to Peru for a month. Melly says I don’t have to go back to get my teeth seen by the dentist until Dr. Hoppes gets back, if I can wait that long. I am sure going to try! I am going to try to wait FOREVER! But it is possible that my teeth will grow points again and start to hurt me before Dr. Hoppes gets back. That would mean I would have to go see the dentist by myself with no Dr. Hoppes to tell him how special I am. 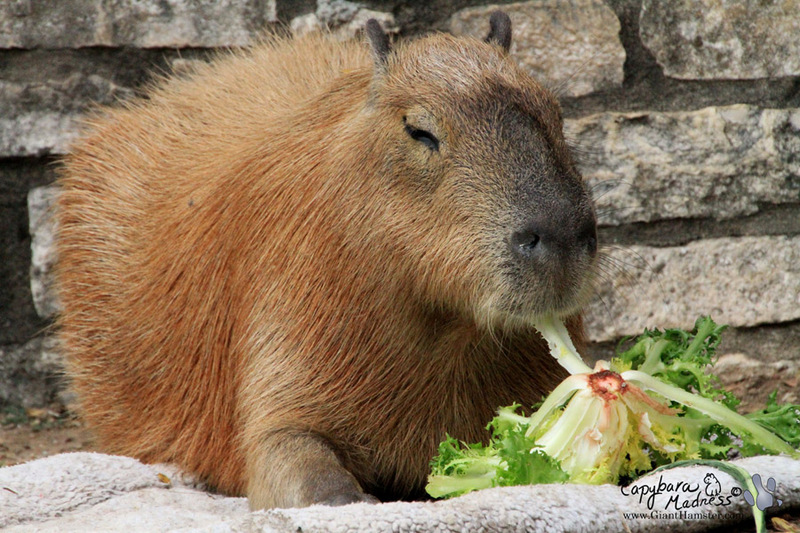 Melly says that if I am a good capybara and take my medicine that maybe the infection in my teeth will go away and I won’t have to have any teeth pulled. I don’t want my teeth pulled! I am pretty sure that would hurt a lot. For a long time. And make it hard to eat. And I’d have to go back to the dentist all the time to have my teeth filed. So I am crossing my paws that the medicine works. If all of my friends cross their paws and we all close our eyes really tight, maybe this whole thing will go away. Some humans don’t like to the dentist either… but it helps keep up healthy. Be brave! Try not to bite Melly — she loves you so much, Hopefully the medicine will help. Tell Melly that Ribena is quite nice to make medicine taste better. When my Guinea pig Daph was poorly, I used to put some in his medicine, and he took it well. Keep getting better Gari, and don’t bite Melly, for goodness sakes! Happy Thanksgiving! Aww, Melly’s posts aren’t THAT bad. You take all your meds like a good boy, with no biting, and I’ll have all the cavies, humans, and feathery things here thinking good thoughts for you. Deal? You look so cute walking nose-to-knee with Rick. I hope you have a nice restful weekend!! My heart was in my throat when you were sick, Garibara!! Worrying is bad for me, it makes me wrinkly! So eat your yogurt and get lots of tummy rubs. Melanie, I prescribe large margaritas! I hope your teeth get all fixed up real soon and I agree vets are no fun at all. My Mom is an incomplete quad and uses a wheelchair full time. So I go places in her lap like downstairs to check the mail and visit with the neighbors. I ate kale today and hope maybe you got some too as it is very tasty. Crossing all paws and any other appendages here for you, Garibear! Paws are crossed! Keep taking that medicine. I’m crossing my fingers for you and Buddy, Boe, and Saydie will be crossing their paws for you. You are a brave guy so be nice to Melly and take your yucky medicine so you can get better, Melly really is only trying to help. Capy hugs and kisses Gari, I love you!!! I don’t know if Melly’s blog posts were a disaster, Gari, I think she’s just really, really worried about you. And you have to feel sorry for her trying to give you the meds, because you can probably run faster than she can. Maybe I shouldn’t give you any ideas about outrunning her? Anyways, I hope you keep improving & recover completely. I’m continuing to keep you & all your household in my prayers. Paws crossed here in California! Hope you are feeling better Gari….You are soooo cute!!!! Oh no Gari! I am so sorry to hear you were so sick but so relieved to hear you are getting better. What a scare. I seem to have fallen off the mailing list. I better check my spam settings to make sure your blog notices aren’t ending up there. Stay well Gari! Oh poor Gari baby! I’m glad you’re feeling better but I will pray for your teeth situation. Be well, sweetheart! Hugs! I just love just love your pictures, glad Gari is better.